The weather here in Portugal, over the last few weeks, has been bright and sunny with temperatures up to 20C. The warm weather is an early reminder that my “tractor tyre” midriff currently concealed, but still lurking under the layers of winter clothes, needs urgent attention. Oh no, I need to focus on the dreaded “D” word!. Iced Oranges make a delicious fat-free dessert! 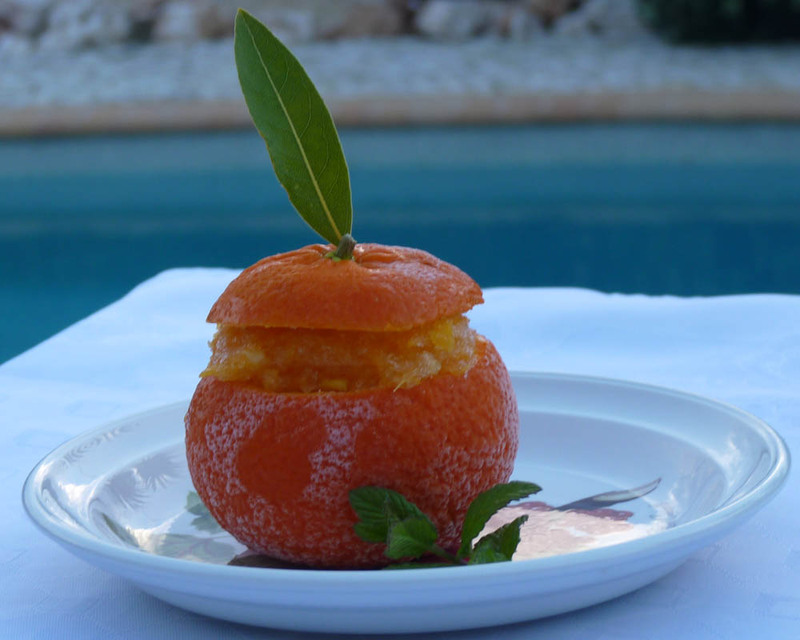 Looking for inspiration I found a great recipe for “Iced Oranges”. Not only is it simple to prepare and absolutely delicious – it is fat-free! 1. Put the sugar in a heavy-based saucepan. Add half the lemon juice, then add the water. Cook over a low heat until the sugar has dissolved. Bring to boil and boil for 2-3 minutes until the syrup is clear. 2. Slice the tops off eight of the oranges to make “hats”. Scoop out the flesh of the oranges and reserve. Freeze the empty orange shells and “hats” until needed. 3. Grate the rind of the remaining oranges and add to the syrup. Squeeze the orange juice from the oranges, and from the reserved flesh. There should be 1¼pints/750ml. Squeeze another orange or add bought orange juice, if necessary. 4. Stir the orange juice and remaining lemon juice, with 6 tablespoons/90ml of water into the syrup. Taste, adding more lemon juice or sugar as desired. Pour the mixture into a shallow freezer container and freeze for 3 hours. 5. Turn the orange sorbet mixture into a bowl and whisk thoroughly to break up ice crystals. Freeze for 4 hours more, until firm, but not solid. 6. Pack the mixture into the hollowed-out orange shells, mounding it up, and set the “hats” on top. Freeze until ready to serve. Just before serving, push a skewer into the tops of the “hats” and push in a bay leaf (mint) to decorate. I am looking for more fat-free desserts and lunches…any ideas please? I find that soup is very filling and can be made fat free or close to it. A few recipes are on SLTW: Pea Soup, Harvest Soup, Onion Soup. Also, vegetarian chilis and stir fries. They aren’t all there, but quite a few are referenced in that post. when we pull categories of posts together for them. WOW!That will be my dessert for the sunday linch for sure, thanks!!!!!!! Do you have any low fat recipes you can share, please? Ooops, your orange looks absolutely delicious and I could go for something like that on a really hot day. That looks and sounds yummy! Now I need the weather to warm up here. Yeah, I need to find some hot fat-free recipes! This iced orange looks really good. I will definitely try it. As to low fat recipes, I don’t know any. Sorry! I see you’re from Oregon. My siser, Rose. lives in Oregon. She lives in W. Linn. I’ve been to visit and Oregon is a beautiful place. I like the fact that there are so many trees all over the place. And it’s really clean. I like the condom idea — we should do the same here. Tasty!! Wonder if the same method would work with pineapple or melon. I’ve just been trying to figure what’s missing from your pic. Cream! I reckon I’d have to serve it with a nice dollup of chunky cream, oooh Cornish clotted cream…drool! I’ve had a frozen cocktail in a pineapple before (yeah I know it was a bit “Dell Boy” complete with a cocktail umbrella…) so I cant see why that would not work. Not sure about melon…now as for Cornish clotted cream…hmmmm I’m feeling homesick! I’d rip off my own arm for some yumtastic scones, strawberry jam and a mound of clotted cream right now! Hi EC, when I took the above photo it was blowing a gale and freezing cold. Mr Piglet did not twig why we were having an iced sorbet on a cold day until the camera, cloth, and props appeared! He just shook his head…and walked away 🙂 Poor long suffering Mr P! Miss Piglet, this recipe sounds and looks delicious. I love the photo of the orange with the little cap on top, punctuated by the bay leaf. Thanks for sharing this one! Thanks Ellen, but you’ve no idea how difficult it was to take a photo before the leave blew away! Hi Portugal! Try http://www.fattoskinny.com loads of sugar free stuff there!! Happy hunting!! Hi Country Living thanks for the link I will check it out! Sorry, on a side note:-) The websites owner, his wife, can convert any “normal” dish into sugar free! It’s pretty cool! So if you have something you’re craveing that’s not on their list, ask em! This sounds great! Sounds like something kids would like too – I have to print this out for future use!